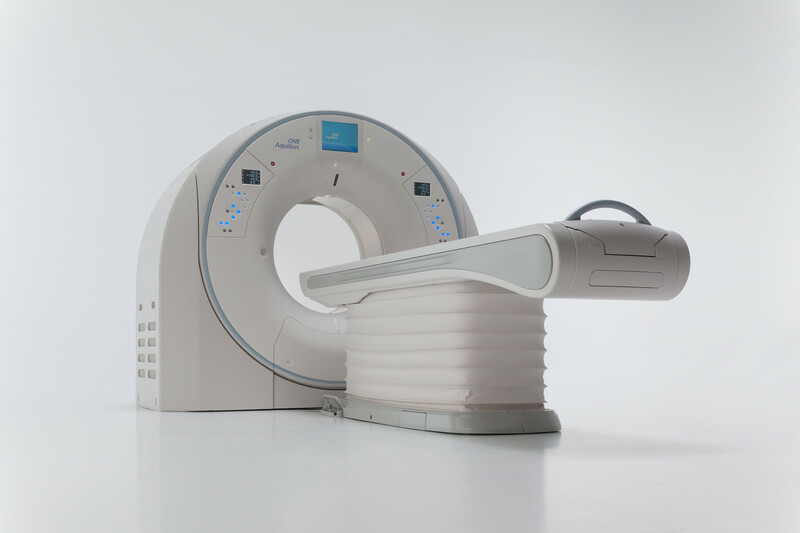 Canon Medical Systems USA, Inc.’s Aquilion ONE / GENESIS Edition is capable of imaging the entire brain with a single 640-slice* rotation, covering up to 16 cm. CHICAGO, Nov. 28, 2018 – In stroke, time saved on imaging is time gained in the treatment window. The recently updated guidelines from the American Heart Association and American Stroke Association expand the window of time for clinicians to treat stroke. This makes protocols, like Neuro ONE on the Aquilion™ ONE / GENESIS Edition CT system from Canon Medical Systems USA, Inc. combined with Vitrea’s 4D Neuro Perfusion software, more important than ever. The Aquilion ONE / GENESIS Edition is capable of imaging the entire brain with a single 640-slice* rotation, covering up to 16 cm. The 4D Neuro Perfusion package from Vital Images evaluates flow and perfusion deficits to help physicians identify affected brain tissue. The scanner’s Neuro ONE Protocol allows the acquisition of multiple low-dose volume scans of the entire brain during contrast infusion to provide whole-brain perfusion and whole-brain dynamic vascular analysis in one exam. To round out Canon Medical’s stroke capabilities on the Aquilion ONE / GENESIS Edition, its Forward projected model-based Iterative Reconstruction SoluTion (FIRST) MBIR** improves high-contrast spatial resolution and low-contrast detectability in the brain, opening doors for the possibility of seeing early signs of stroke with CT.
A CT system that can quickly map the brain to help locate the clot is what helps doctors meet the demands of time during these critical moments. The Aquilion ONE / GENESIS Edition makes use of intensive, clinically focused research and innovative technological developments. The system’s advanced perfusion maps assist in diagnosis and therapy response verification of stroke. Canon Medical is showcasing its innovative CT technology at this year’s Radiological Society of North America (RSNA) annual meeting in Chicago, November 25 – 30, 2018 (Booth #1938, South Level 3). More information available here and booth #1938 during RSNA.